Thousands of concertgoers braved threatening skies to attend a lively concert of all types of Jewish music at Summerstage in Central Park on Monday night. The show was one of the 100 events that are taking over Manhattan all this week to celebrate KulturfestNYC, the 100th anniversary of the National Yiddish Theatre Folksbiene. While the notion of Yiddish music and chazanus might seem to appeal only to the older set, concert goers of all ages were swept up by the music during the program, which ran over two and a half hours and was hosted by radio personality Nachum Segal. Even the attire of the performers, from Malovany’s white dinner jacket to Schmeltzer’s white derby and colorful bow tie, seemed to echo the message of the night: that Jewish music is alive and well with something to appeal to everyone. 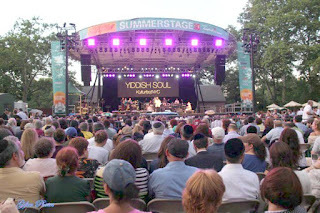 Having five of Jewish music’s top performers taking the stage in the midst of the most visited urban park in the city and one of the most filmed locations in the world seemed surreal for some. i wish i had known about this to go to NY to be there. oy this did my heart good! Thank you for posting this. Shabbat Shalom from Yerushalayim.